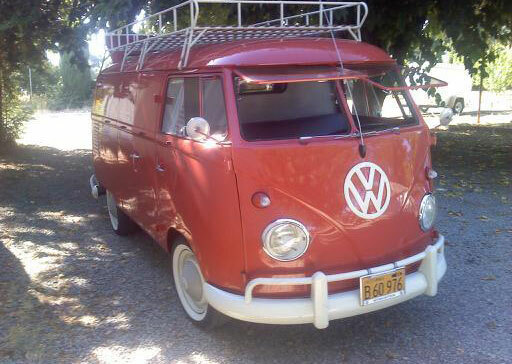 1960 the unique, rare and beautiful Volkswagen Panel. Original sealing wax red 60 double door VW Panel Bus no rus, 1688cc w/machined 88's. 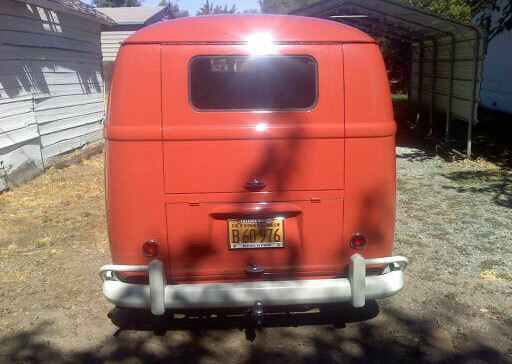 honest daily driver, year-of manufacture commercial plates, interior all original paint. exterior / body re-painted in '97. have re-built front end (king-link), trans has bay-window gears, also have re-built reduction boxes (not yesterday but all solid). solid driver. battery clip replaced mid-90s (nos). secure as when i first brought it home in '87. have old registration paper work as far back as '64. seat has been re-done with an awesome match to original, have original door pockets and panels but never cut them in (wanted correct rivets). i also have the 36hp motor i took out of it. wood rack is an extra $800.00. From alles sides underside etc. Like the photo link below. Here i can zoom in and out and see the bus realy clear. And i see that your bus is for sale since august last year. What is your best price.